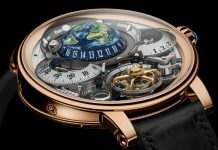 They say you can’t be all things to all people but dammit if Bovet isn’t going to try. The Virtuoso V is the ultimate convertible watch; not only does it have dials front and back, but it’s 12 o’clock crown means that it can work nicely as a pocket watch too. Granted that kind of versatility is best suited to an Edwardian dandy but it’s impressive nonetheless, especially in it’s new ‘Lavish Red’ colouring. The front dial shows off that beautifully deep colouring exceptionally, with a mesmerising guilloche apparently imitating a fan of feathers emanating from the centre of the dial. Other than the finishing, it’s wonderfully minimal, with retrograde minutes at 12 o’clock and jumping hours in the centre. Flip the watch over and you have a touch of that guilloche – as well as a more traditional hour / minute display – but with the manual-wind movement on full show. This side also includes a power reserve indicator which, given the Virtuoso’s five days of power, probably won’t be hitting empty all that often. The seconds is subtly positioned at 6 o’clock and, rather than a typical 60-second scale, opts for 20, with three different blue steel hands taking their turns to sweep across it. The last complication is actually not immediately obvious. Because both hour displays can be set independently of one another, the two sides of the watch effectively double as a dual time zone display. Sure you need to flip the whole watch to switch between them, but it’s a nice touch. To finish off the Virtuoso’s convertible vibes, it comes as standard with both a black alligator strap and a case-matched gold chain so you can wear it however the mood takes you. 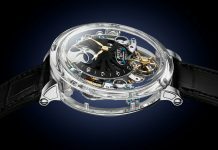 Share the post "Introducing: Bovet Virtuoso V with Red Guilloché Dial"